Over the course of an assignment for UC San Diego's Human Computer Interaction Course, I was tasked with iterating and designing a solution for urban commuter needs; as a team of one. The challenge I ran into was that an application only solution would fail to address the core concern of users, which is getting where they need to be quickly. It wouldn't matter if you replaced the MetroCard with a mobile application if the train was delayed; the delayed train would be a major pain point for the user. I researched existing and emerging technologies, and designed a systemic solution to unreliable mass transit, which I've called Streetcar. In this initial phase, I conducted interviews, compiled personas from analogous campaigns, and did a comparative assessment on mass transit models, in order to build up a body of qualitative research. I learned that my target users—commuters—value faster commutes over faster on-boarding, and that dependable fixed-route transportation options are far superior to flexible, on-demand options. To better gauge the pain points of the average New York commuter, I interviewed fellow New Yorkers to see their wants and needs. From these, I determined that there were two routes for improving transit: either (a) make on-boarding faster, or (b) create a new transit mode entirely. I did some initial design studio and storyboarding to explore possible solutions along both routes. Initial artifacts for making on-boarding faster developed into a kind of Waze for the Subway app, which would allow riders to notify a wider community about delays en route. However, it became increasingly clear that making on-boarding faster would fail to create the underlying want of all commuters for fast and reliable transportation. Therefore, I was left with route two: a new transit mode. Knowing what needed to be done, I turned my attention to New York City's existing services and the people that use them. Bus Turnaround NYC is a diverse group of New Yorkers determined to turn around the poor service that plagues New York City's bus system. As matters of improving city mass transit were analogous, I opted to cited their persona data in my research. Credit for the original research belongs to Nathan Johnson, Neil Freeman, Kuan Butts, & al. Bus Turnaround NYC focuses on reforms to New York City's existing bus infrastructure. However, several conflicting agencies manage the bus system. For instance: while the MTA runs the buses, the New York City Department of Transportation manages the bus stops. These administrative barriers make a holistic approach to bus rapid transit currently years away, if not impossible. Because of that finding on the parochial nature of extant public agencies, I concluded that a more disruptive alternative to existing transit options may be the scalable solution. As of May 2018, one of the two big transit tech hotspots is in on-demand autonomous vehicles; otherwise called microtransit. Microtransit solutions, like UberAIR, could circumvent mixed traffic entirely through the use of unmanned passenger drones that fly over the roadways and go precisely where customers need to go. "[Designated stops] save the driver the time it takes to drive to the precise preferred location of each passenger, which is especially crucial if there are other passengers on board whose travel time is also valuable... [in having a customer walk to a designated route stop] the customer is taking on inconvenience in return for a more efficient transit service...when you connect places where many people want to go together, along a fast, direct path, the resulting service is both efficient to provide and useful to vast numbers of people." On the other hand, the compiled persona research found that microtransit solutions like UberAIR would not be appropriate for most urban commuters. At her age, would Beth be comfortable taking an unmanned drone over New York City? Would her bad knees allow her to climb into an unmanned done? As she's retired, would Beth be able to afford taking it regularly? Would Jon be able to, with ease, take his kids to school while he's on his way to work in a flying taxi? Would Natasha be willing to spend extra money on a flying taxi when she's frustrated about spending money on an earthbound one? I determined in the course of assessing these personas that, in all likelihood, they would not. That said, in understanding this, I realized that the solution for commuters like Beth, Jon, and Natasha, must operate on fixed routes. And this immediately directed me to the second of the two big transit tech hotspots: Trams. New York City and the surrounding area are no stranger to trams. The city used to be filled with streetcars up until the 1950s, NJTransit runs the Hudson-Bergen Light Rail over on the west side of the Hudson River, and, in 2016, Mayor Bill DiBlasio proposed a streetcar linking Brooklyn and Queens. Light rail and streetcars are relatively inexpensive, and can be built for as low as $43M per line, or as much as $204M per line, as is the case with Portland, Oregon. For contrast, the Second Avenue Subway in Manhattan clocked in at $2.1 billion per mile. Streetcar capacity can also match subway capacity from time to time: trams can generally serve neighborhoods with about 30 people per gross acre; whereas metro lines can serve neighborhoods with about 45 people per gross acre. However, fixed streetcar lines often obfuscate the desires of monied interests, like real estate developers. Yonah Freemark, author at thetransportpolitic.com, explains in a video for Vox that "From my perspective, [streetcars] are almost entirely designed to support economic development and not increase mobility." and that any public investment in a neighborhood, such as new sidewalks or retail improvements, can encouraging development just as much as a streetcar line. While trams are good at offering capacity and a fixed, predictable route; their dependence on rails limits its ability to extend its range. In most cases, this means that they can only serve affluent communities ripe for development, instead of the neighborhoods where Beth, Jon, and Natasha, reside. Is there a way around this dilemma? China may have the answer. In Zhuzhou, China, unmanned rail buses are currently undergoing trials. These railbuses uses a system of sensors to navigate along road markings instead of on a track or attached to a cable. A five carriage railbus could hold around 500 people, whereas an articulated MTA bus can legally hold, at most, 62. Furthermore, super-capacitors are emerging as a way to power similar manned trams, allowing them to travel from stop to stop without the need for catenary overhead wires. For New Yorkers, a tram—even one that is driverless and running on existing bus lanes—would conform to existing mental models of mass transit. Beth, Jon, and Natasha could ride the tram as though it were the bus, and the nearly tenfold increase in capacity per ride would reduce onboard crowding. And, most importantly, as these trams would be free to use roadways, they could operate in any urban neighborhoods, regardless of developer ambitions. With this information in hand, I concluded that New York City's mass transit future rests in these autonomous railbuses. I took a novel approach to the design synthesis phase. In order to keep the product's value proposition and vision top of mind throughout the process, I wanted to focus on the bigger picture of this product's potential social and environmental impact. To this end, I applied insights from Artefact, a design agency in Seattle, WA, and used those insights to frame what a solution might do. Mass transit is a public thing by design; it's right there in the name: transit en masse—all together. Therefore, it would be wrong to dismiss the real consequences that a new technology like this could cause in a city, for good or for ill. For instance: the last major innovation in city travel—highways—proved devastating for communities of color in the 1950s and 1960s. An innovation like unmanned streetcars must therefore be examined holistically, in the context of the community it will ultimately serve. Therefore, knowing that a design solution such as this have incredible stakes for urban communities, I decided to pursue a humane evaluation, in a way that is analogous to a more traditional heuristic evaluation. The prompts are given corresponding archetypes, like traditional Tarot Cards. They are organized into three categories: Scale and Disruption, Usage, and Equity and Access. Provide a comfortable experience that allowed for riders like Natasha to either maximize their productive time or relax after a long day. 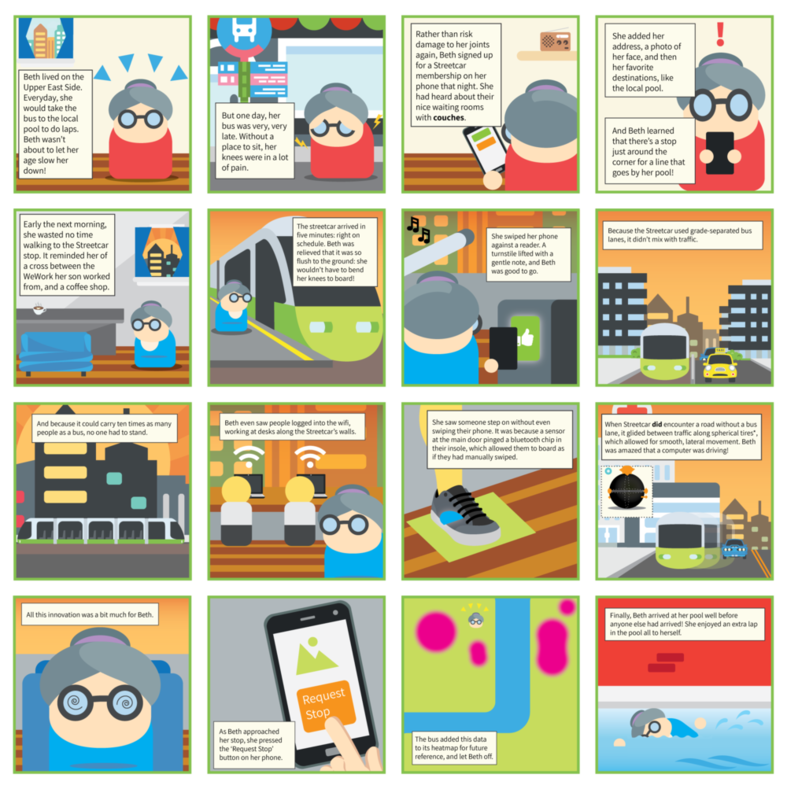 How might we help Beth live her life to the fullest through mass transit? How might we help Jon have meaningful time with his kids as he drops them off to school on his way to work? How might we make Natasha's morning commute more productive than her actual office? With these product requirements in mind, I generated the following storyboard to provide an overview of the streetcar experience from the point of view of Beth. I opted for a higher fidelity storyboard to best convey the concept to audiences. Finally, with those storyboards in mind, I diagrammed the overall system that would define a higher fidelity version of this streetcar service. By examining the environmental and social impact this product could have, for good or for evil, I was able to diagnose pitfalls in the original concept. Knowing where it risked causing harm, I could use that solution to devise a solution that created additional differentiating advantages for this product. Failing to empathize with your users' intentions will doom your ideas to failure every time. When you can look at someone's situation and then say about something you've worked hard on, that "We need to make this change to the design for the sake of this person" that's a kind of personal leadership that will only serve you and your product well. While Tesla and Uber fawn over microtransit solutions, the need for mass transit in cities will undoubtedly continue. Streetcar could be a dynamic solution to cities straining to meet the demands of growing populations with aging infrastructure. Autonomous railbuses, which use existing roadways, offer a unique opportunity to reduce congestion and commute times not only for New Yorkers but for all the major cities of the world. Hanson, Susan; Giuliano, Genevieve (2004). The geography of urban transportation. Guilford Press.